Jean Patou Joy has been an inspiration and landmark fragrance since its creation in the 1930s. Jean Patou Joy was designed as Jean Patous clients, especially rich American women, were bankrupted by the 1929 stock market crash. Jean Patou Joy aimed to be the luxurious tonic that exorcised the Depression. 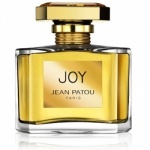 Jean Patou Joy gathers extremely rare flowers in a unique concentration, it has 10600 flowers of jasmine and 28 dozen roses compose the heart of a single ounce of Joy. This is delicately layered over an irresistible wake of a generous armful of two exceptional raw materials, May rose and Grasse jasmine, matched only by ylang-ylang and tuberose. Jean Patou Joy is a magnificent and heady perfume that also houses notes of Aldehydes, Peach, Leafy Green, Sandal, Musk and Civet. Jean Patou Joy gathers extremely rare flowers in a unique concentration, it has 10,600 flowers of jasmine and 28 dozen roses compose the heart of a single ounce of Joy.